Stunning flowers…I miss the color! Thanks Donna! Hope you get some great color soon. This is one crazy year. The earliest I have ever seen Daphne start to bloom. Are you sure yours is ‘aureomarginata”? could it have reverted? They are such fabulous plants and not easy to find. When I first started the garden I wanted the pink flowering type but was only able to locate the white. Since then I have bought whatever I could find. The fragrance is so powerful I know when it blooms the moment I walk out the door. Daphne is available here in the garden centers from now to early spring usually, but I haven’t been looking for any special variety. So Sandra, can you tell me are mine the pink flowering or the white? They have started out very dark pink but are opening to white. Thanks! That Alyssum has never stopped blooming since I planted it last spring. It’s up next to the foundation of the house so it gets some protection but it is surprising to see it keep going. 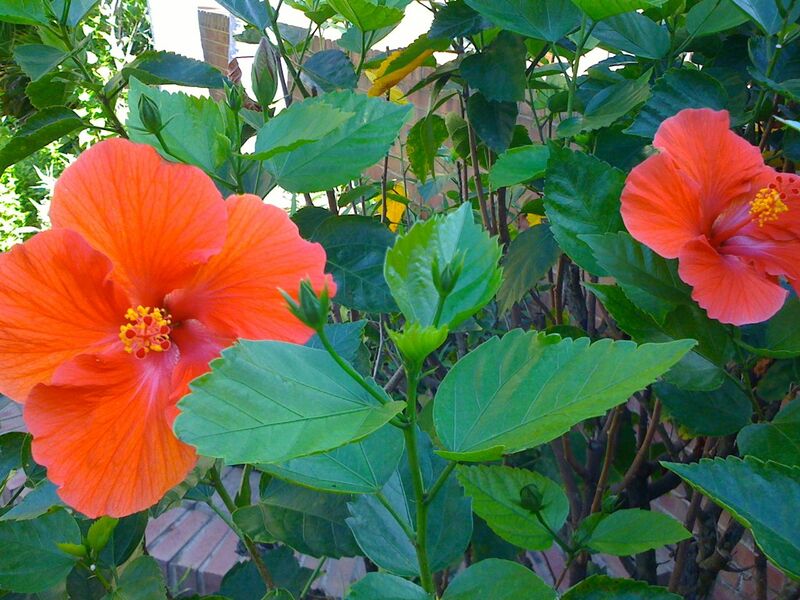 I like that Hibiscus color too. I’m not familiar with Geum so looked it up just now–seems like a nice perennial. Your things will be back in bloom in no time! Lucky you, to have a trip to nice warm Florida!! 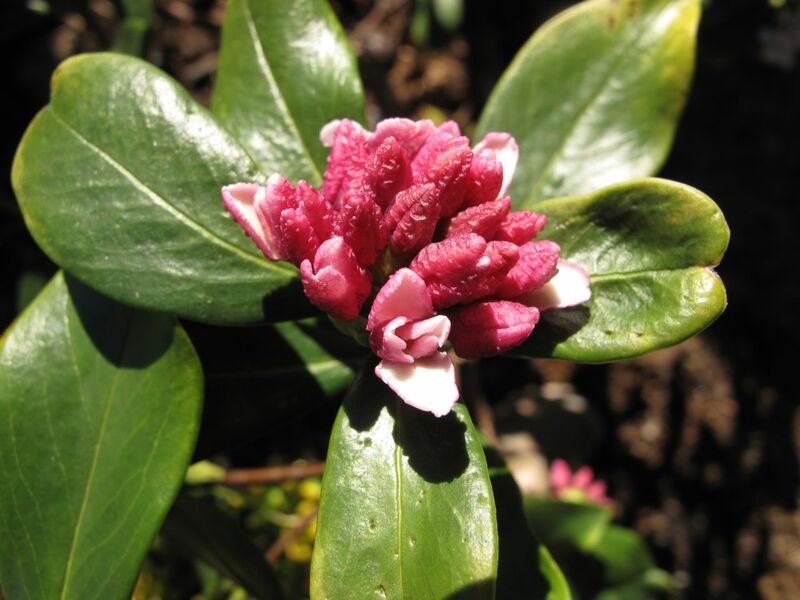 Daphne perfume is divine, we have one perfuming our woodland, have to go there and have my daily fix!! 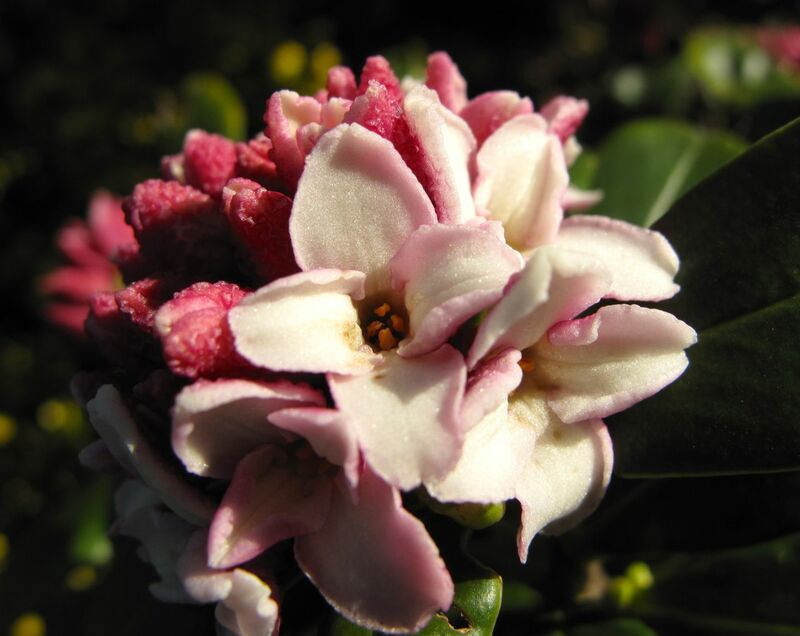 I imagine the Daphne is perfect in your woodland setting Pauline. 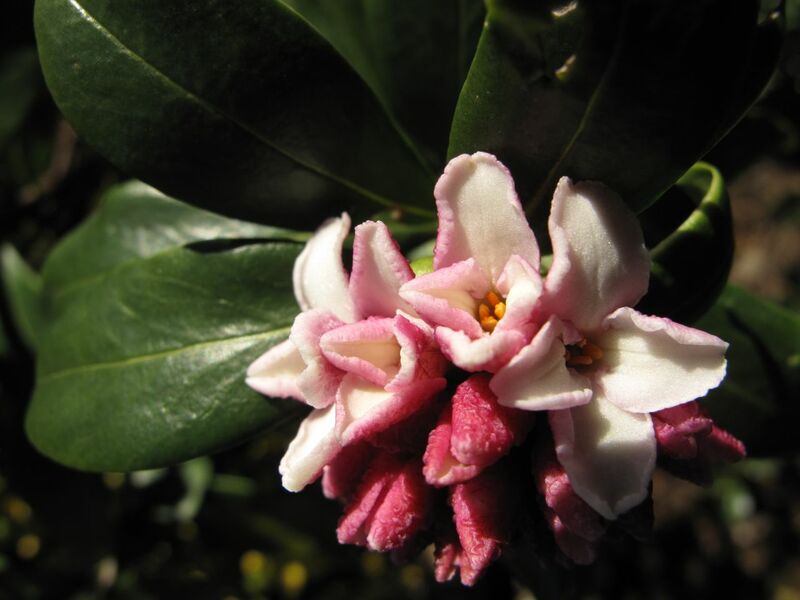 Mine are opening slowly but I was able to catch that nice scent yesterday for the first time this year–heavenly! Your post is very welcome – here snow is covering the ground and more is falling. 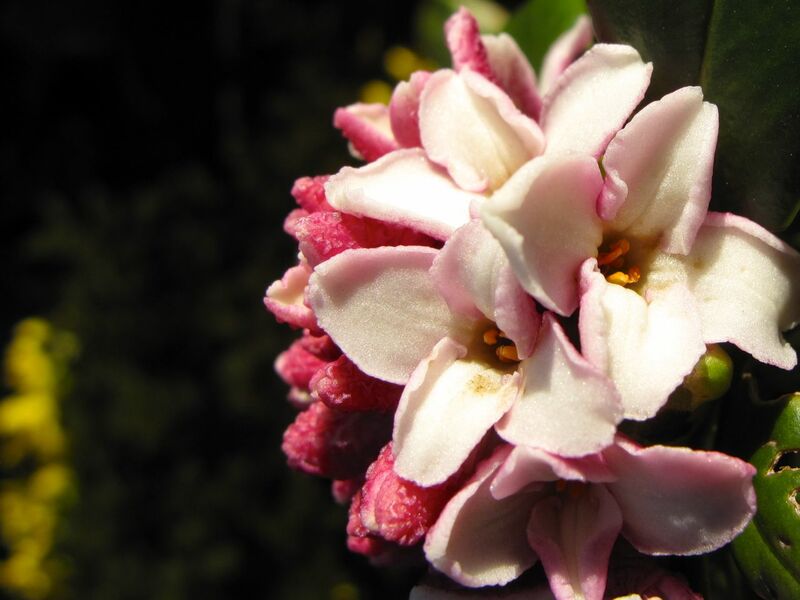 That daphne is lovely and your photos do it justice. I can imagine that scent! I glad you enjoyed seeing the Daphne Malc. Snow can be nice if you don’t have too get out and drive in it. I usually like to see it fall and then want it to disappear quickly. Your colorful stems would look nice against the white snow. I too await spring… alas the joy these plants bring as soon as they show any bit of color! My friends in Raleigh already have winter aconite in full bloom… mine are just begining to emerge… have been jealous for several weeks! Do you have winter aconite? If not would love to share…. I’m in Wake Forest!